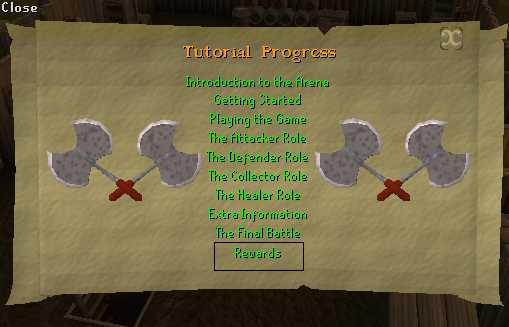 The Fremennik Task set is the fifth set of Tasks to be released by Jagex. As the name would suggest, it is based on the Fremennik lands. This is a members only diary. The tasks range from Easy to Hard, and get more difficult with higher requirements each level. 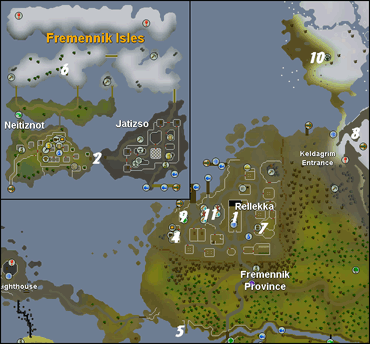 Like all diaries, there is a reward after each level, which has several effects in the Fremennik lands. Council Workman: The Council Workman can be found south of Rellekka, on the bridge. Yrsa: She can be found in her clothes shop in Rellekka. Advisor Ghrim: He can be found in the throne room on Miscellania. Head east of the Fremennik Province past the Golden Apple Tree until you reach the Fremennik Slayer Dungeon. 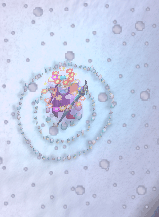 Or with a lunar/dramen staff, you can use the code A-J-R on a fairy ring and enter the dungeon. Once inside kill a cave crawler located in the first room. Be sure to have anti-poison for they are very poisonous. To kill it you must have at least level 10 slayer. 2. Kill five rock crabs on the shore near Rellekka or on Waterbirth Island. 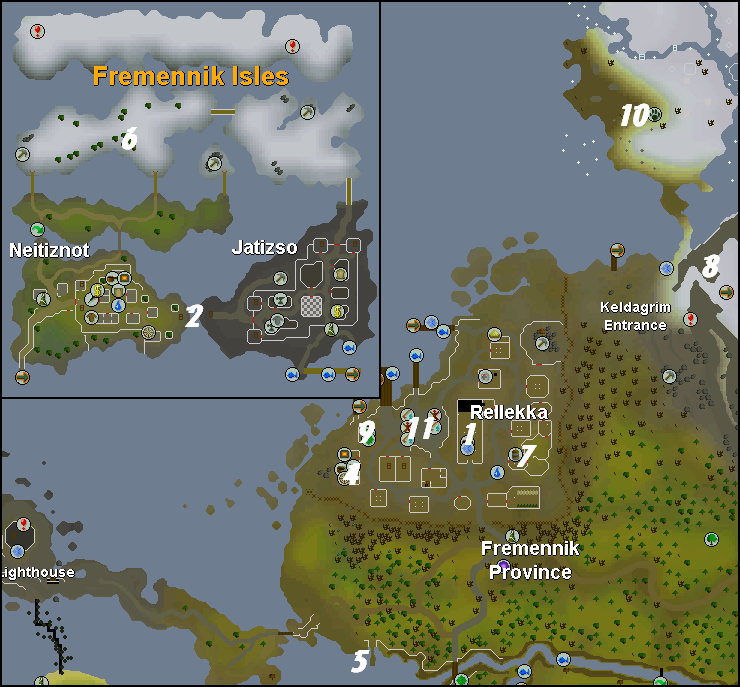 Go north-west of the Fremennik Province until you reach the shore. 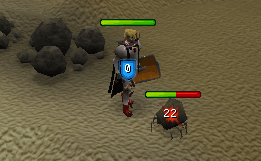 Once there, kill five of the level 13 rock crabs. 3. 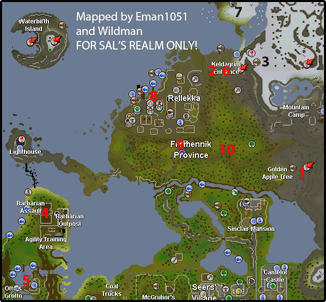 Find the highest tree on the Fremennik mainlands. Head north-east of the Fremennik Province next to the shore of rock crabs until you see a mountain. Go to the top of the mountain and go next to the windswept tree. Or with a lunar/dramen staff type in the code D-K-S on a fairy ring and go north until you reach the windswept tree. 4. View the rewards in the Barbarian Assault tutorial. With a games necklace teleport to Barbarian Outpost and go into the building. Once inside talk to Captain Cain and talk about the tutorial. Either listen to the whole tutorial or click to review the rewards. 5. 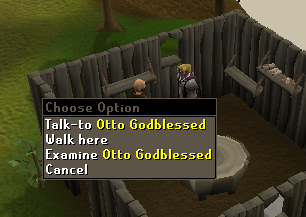 Speak to Otto Godblessed about barbarian training. From the Barbarian Outpost go southwest till you reach Otto's Grotto. Once there speak to him and learn about barbarian training. 6. 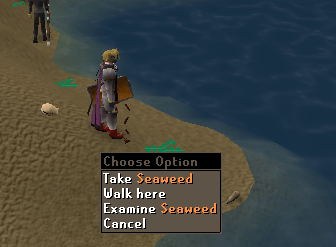 Collect three seaweed from the shore north-east of Rellekka. Go back to the shore where you killed the rock crabs and went up to the mountain. Once there go to the shore line and pick up three seaweed. 7. Find the Hunting Expert on the northern ice plains. 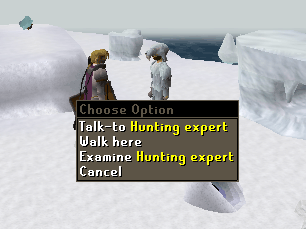 The Hunting Expert can be found in northern ice plains hunting area right after you ascend the stairs. 8. Catch a fish off one of Rellekka's piers. 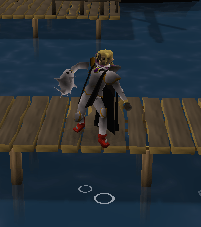 On Rellekka's piers either bait/lure or harpoon a fish (catching Lobsters will not fulfill this task). Summon a familiar to get your summoning points below normal. Afterward, go to the entrance of Rellekka and recharge your points on the small Summoning Obelisk. 10. Kill an adult black unicorn. 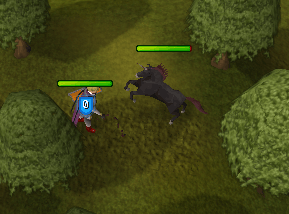 In the eastern section of the Fremennik Province find an adult black unicorn and kill it. If you enchant your Lyre while wearing these, you will gain more charges for your fish. While these are equipped, Peer the Seer will deposit your items in the bank for you. 2. Watch a shouting match between Fremennik Isles guards. Talk to Maria Gunnars to take you to Neitiznot, once there go all the way east and climb up the ladder. Once up there right click the guard and choose watch-shout option. 3. Interact with a pet rock. To obtain a pet rock you must speak to Askeladden, who is outside of the long hall. 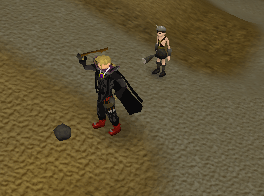 Once he gives you a pet rock click interact where you can either talk, stroke, feed, fetch or stray. To complete this task you need three molten glass and a glassblowing pipe. If you don't have molten glass you can make it by using soda ash with sand. Once you have your items go to the furnace building that is all the way west in Rellekka. 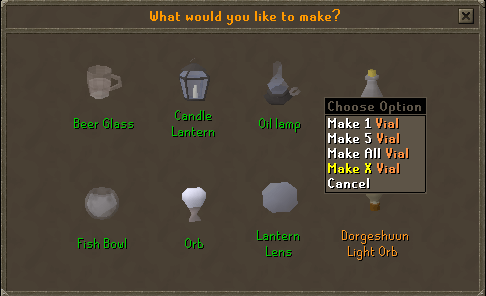 Use the glassblowing pipe on the molten glass and choose vials. 5. Go to the Fossegrimem and charm her into accepting a raw bass. 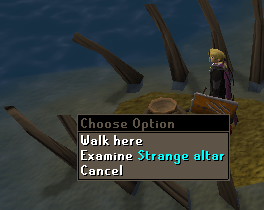 Go to the strange alter south-west of Rellekka and put a raw bass in it. Then with your ring of charos (a) equipped, charm her into accepting it. 6. Make cheese in the dairy churn in Rellekka. Get either a bucket of milk, butter, or a pot of cream and go to the house in east Rellekka. Once there click churn dairy churn and choose the cheese option. 7. Wear yak-hide armour and kill an ice troll. Go to Neitiznot and go north, across the bridge. Once across go a little east until you reach level 74 ice trolls. Equip your yak-hide armour, if you do not have any you can make a full set with 3 cured yak hides. After it is equipped, kill one. 8. Use a fairy ring to appear on a mountain top, near the windswept tree. In Zanaris go to the fairy ring. With your dramen/lunar staff teleport using the code D-K-S.
9. 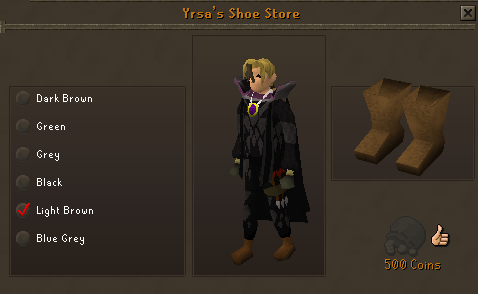 Look at Yras's options for recoloring your boots in her clothes shop in Rellekka. Go to Yras's clothes shop in west Rellekka and talk to her about recoloring your shoes. It will cost 500 coins to get the screen to appear, and she won't let you look while wielding a weapon or shield. 10. Successfully hunt a sabre-tooth kyatt. Go to the Trollweiss Hunting area. Once there go to the sabre-tooth kyatts, before teasing one with a teasing stick you need to trap a pit. Trapping a pit requires logs and a knife. Once trapped tease one with a teasing stick and jump over the trap. After a few times the kyatt will fall into the trap and die. 11. Steal a fish from Rellekka market. Go to the Rellekka market place and steal from a fish stall. To claim your reward, speak to Yrsa in Rellekka west of the market. You will gain approval faster from your servants in Miscellania and Etceteria while these boots are equipped. 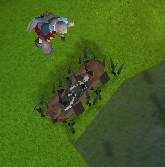 While wearing these boots, you can use the broken pier to travel quickly between Etceteria and Miscellania. As long you have a Lyre in your inventory and these equipped, you will be able to teleport for free once per day. 10,000 exp to any skill above 40. 1. Kill three dagannoths in the first layer of the Waterbirth Island Dungeon. Speak to Jarvald at the westernmost dock in Rellekka to get to Waterbirth Island. Once on the island, head north, then southwest to reach a cave opening. You will be warned before you enter that the cave is very dangerous, and you have a high chance of dying there. The cave does not require a light source. Once you enter, you will be surrounded by Dagannoths, ranging from level 70, to 88 and 90. It is a single combat zone, so you do not need to worry about being swarmed. It is recommended to melee the dagannoths and use Protect from Melee if needed. Note: This part of the cave is the only part that counts for killing the dagannoths, and is the only single target zone in the dungeon. There are no requirements to enter Waterbirth Dungeon, although high combat is recommended! 2. Wear rockshell, spined or skeletal armour and have the locals use an honorific with your Fremennik name. Obtain a set of Rockshell, spined, or skeletal armour by either making it, or buying it from the Grand Exchange. After this, equip the entire set, and speak to a villager in Rellekka. They will greet you with your Fremennik name and a title after it. Such as Spineweilder for wearing Spined armour. 40 Defence is required for Rockshell, 40 Ranged and Defence is required for Spined Armour, and 40 Defence and Magic is required for Skeletal Armor. 3. Complete the Barbarian Outpost Agility Course. Head to the Barbarian Outpost using either a Games Necklace, or walking there from Rellekka or Ardougne. Once there, head behind the Barbarian Assault mini game building and crawl through the pipe in the fence. Once through, simply go through the obstacles in a clock-wise direction. 35 Agility and Completion of the Barcrawl are required to enter the course. 4. Mine pure essence on Lunar Isle. Head to Rellekka and head to Pirates Cove by talking to Lokar. Once there, head up the ladder to reach the top of the boat, and speak to Captain Bently to get a ride to Lunar Isle. Climb down the ladders on the dock. Once you reach the bottom, head north, running past the Suqahs until you reach a ruined building with a ladder heading down. 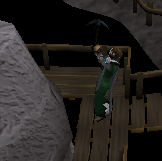 Climb down and head east to reach the Rune Essence stone. Mine it, and you are done with this task. 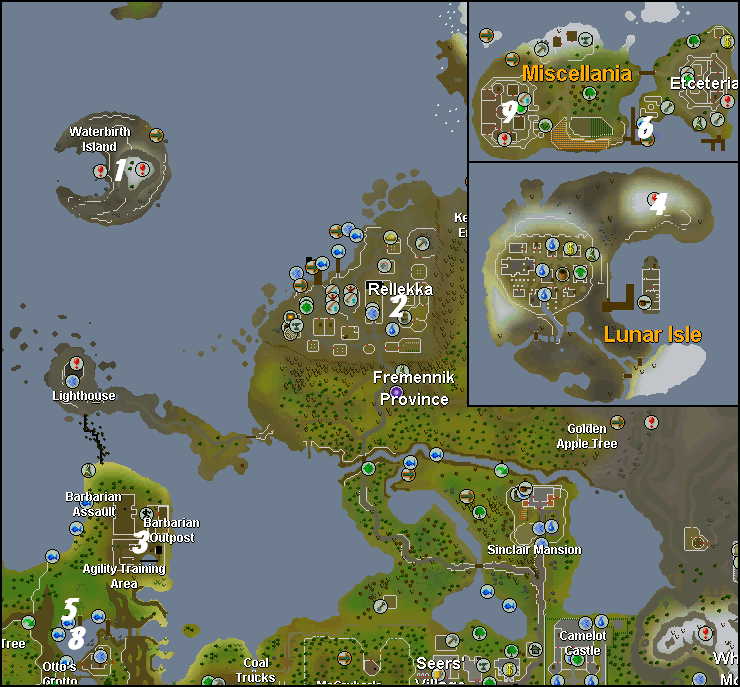 Lunar Diplomacy quest is required to get onto the island. 5. Make a barbarian pyre ship from arctic pine. 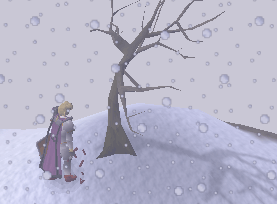 First, we need Arctic Pine; this can be bought from the Grand Exchange, or obtained by chopping down Arctic Pine trees on Neitiznot. After that, we need some bones to use. You can use Mangled or Chewed Bones for this. Mangled Bones can be obtained by rummaging the barbarian skeletons found in the Ancient Cavern, just south of the Barbarian Outpost, but this isn't very common. There is a 100% chance to get Mangled Bones from the Confused Barbarians though. 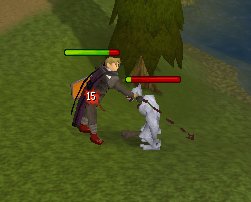 He only attacks with Melee and will always and only drop Mangled Bones. 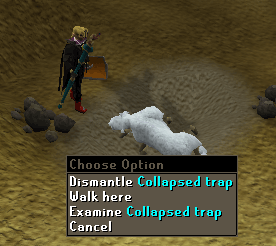 The chewed bones are a rare drop from Mithril Dragons. You also need a Tinderbox or Bow, and a hatchet to make the ship. Once you acquire these things, head near the whirlpool south of Barbarian Outpost. There should be pyre sites around the lake, where you can build your ship. BEWARE: When using Mangled Bones, a level 166 Barbarian Spirit will attack you, it only uses melee, and can hit for a max of 180. Barbarian Training is required to make pyre ships and to enter the Ancient Cavern. 52 Crafting and Firemaking is required to make the Arctic Pine pyre ship. 6. Catch a tuna without a harpoon. Head to the Rellekka docks and attempt to harpoon fish without having a harpoon in your inventory or equipped. Eventually, you will catch a tuna. 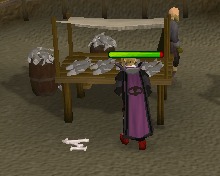 Barbarian Training is needed to fish without a harpoon, and you need 35 Strength and 55 Fishing to do it. 7. Bake a pie using Magic. Quite simple, obtain an uncooked pie, doesn't matter what kind, as long as you can cook it normally. Then head to Lunar Isle and to the Astral Altar at the southern end of the island. Pray at the altar if you don't have lunar magics activated, and cast the spell. The Bake Pie spell requires 1 Astral Rune, 5 Fire Runes and 4 Water Runes. You need 60 magic and completion of Lunar Diplomacy to use this spell. 8. 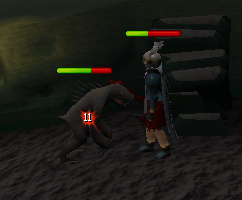 Kill a mithril dragon. Difficult to do, if you don't have the proper gear. 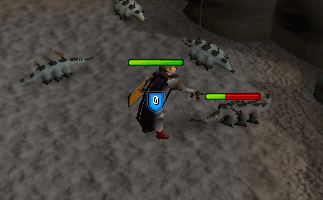 It is highly recommended to use ranged or magic to kill the dragons, as their melee attack hits for 28 fairly often. You need an Anti-Dragon shield for them, so if you are using ranged you must use a crossbow. To reach them, jump into the whirlpool and head south, until you see a staircase on the eastern side of the room. Once you climb up it, you will be surrounded with Mithril Dragons. 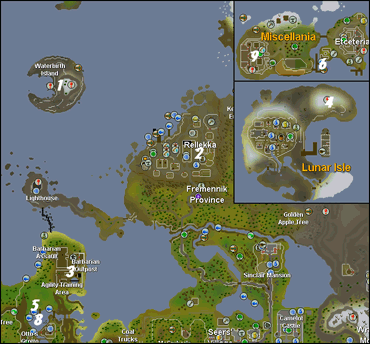 Find a safespot, and mage/range away from there. Bring gear with good ranged and magic Defence, as mithril dragons use all three styles. Once it is dead, grab the items it dropped, and teleport away. If you managed to get the Chewed Bones, you can save yourself some time with the Pyre Ship part of the Diary. Mithril Dragons can drop the Draconic Visage and the Dragon Full Helm. Barbarian Training is required to enter the Ancient Cavern. 9. Get mahogany from your Etceterian subjects. Head to Advisor Ghrim in the Miscellania Castle top floor, and put some workers on the Mahogany Trees. Make sure they are cutting Mahogany or Both. Teak will not work. Royal Trouble is required to get Mahogany from Manage Thy Kingdom. If you enchant your Lyre while wearing these, you will gain even more charges for your fish than with the earlier rewards. While these are equipped, Peer the Seer will deposit all of your items in the bank for you. As long you have a Lyre in your inventory and these boots equipped, you will be able to teleport for free once per day. 15,000 exp can be used in any skill above level 40.